Sittin' n' Spinnin': It's Here! It's Here! 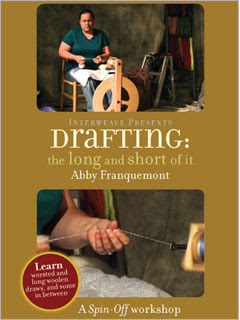 A couple weeks ago I pre-ordered 'Drafting: The long and short of it', a DVD of Abby Franquemont going over drafting techniques... oh, yes, I'm on the mend, still have a bit of a cough, but listen to this! I have been anxiously awaiting its arrival and it got here today! I don't know why I'm so excited, maybe I just like getting packages in the mail. After unobtrusively rushing hubby off to work, I sat down to watch it. I really enjoyed it! She does a good job showing different drafting techniques, although she only uses three different wool preps to draft from, she does mention spinning shorter fibers that sometimes come in clouds (she doesn't mention these but does tell you how shorter fibers can be drafted more easily), and what she does use pretty much covers everything I think. At any rate, its a good video especially if you have found that you are in a bit of a yarn rut and are always spinning either woolen or worsted and you want to break out a bit. I might have to look into getting that DVD...I think I am in a rut when it comes to always spinning the same way.